The c25 is our smallest 6MP hemispheric camera and comes with three clamps for easy installation in suspended ceilings like a halogen downlights. Alternatively it can be equipped with a telephoto lens and mounted above a point of sale area the c25 will provide a very detailed video of the content and allows you to read the serial numbers of the bank notes. The greatly increased light sensitivity of the new sensor technology is further enhanced by the HD Premium lenses also built into the 5-megapixel cameras. These new HD Premium lenses with an f/1.8 aperture are offered in six different focal lengths. This technology, in connection with the new 6-megapixel sensor modules (1/1.8” CMOS), delivers horizontal image angles between 15° and 105° for an image format of 4:3. 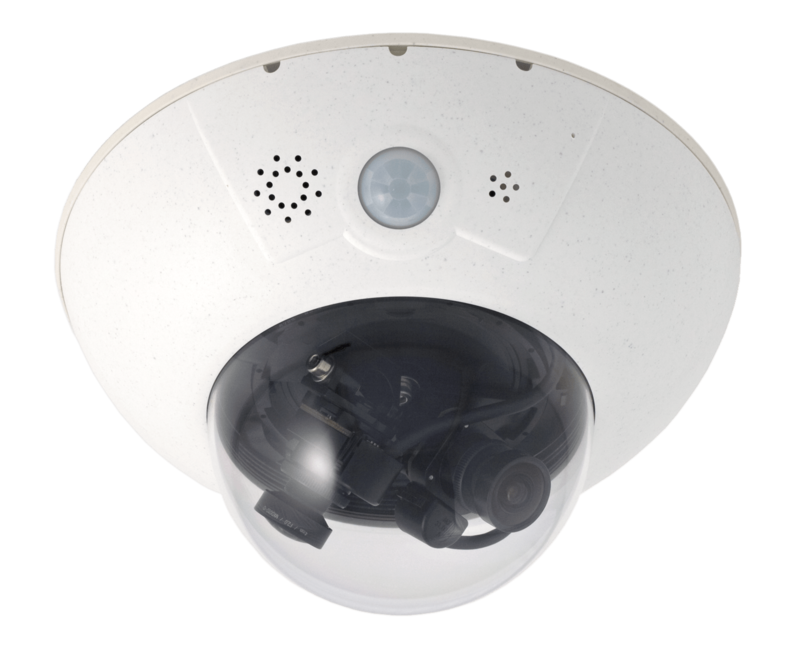 With its compact and elegant dome-shaped housing, the Mobotix DualDome camera system has become an indispensable feature of the now global market of high-resolution network security cameras. Thanks to the flexibility of two adjustable lenses and optional HiRes image sensors, this camera system delivers video surveillance of one scene in day and night mode (DNight models) or it can monitor two different areas simultaneously using different day or night lenses. A single D15D is all that is required to fully monitor an entire shop floor, as well as provide a direct view of the checkout. The simultaneous generation and evaluation of two images with a high degree of image detail not only reduces the number of required cameras, but also minimizes system costs by reducing the wiring complexity, backup power supply requirements and number of recording devices required. All D15D cameras feature direct recording to integrated MicroSD cards (up to 64 GB) or external USB drives and can therefore be used in standalone operation with no additional network load.